Come meet Nick Dragotta, artist of best-selling comic East of West as the first volume of the series launches on Wednesday, 9/11. Nick will be doing a signing at Illusive Comics and Games in Santa Clara, CA as well as attending a launch party at Isotope, The Comic Book Lounge in San Francisco, CA. Please visit the links below for more information! On September 11th from 4 to 10 p.m., Dragotta will do free sketches for anyone who has bought at least one issue of East of West from the Santa Clara comics shop. Volume 1 of the collected graphic novel also launches that day, available for purchase and signing. Check out the official Facebook event page or Illusive's website for more information. Come celebrate with us! Our beloved Kirsten Baldock is crafting up a palette-stunning cocktail list based on Nick’s work in honor of the evening. Mister Dragotta promises a sketchbook-filling Four Horsemen styled evening… and we’re hoping he’ll bring in some original art for us to buy as well! 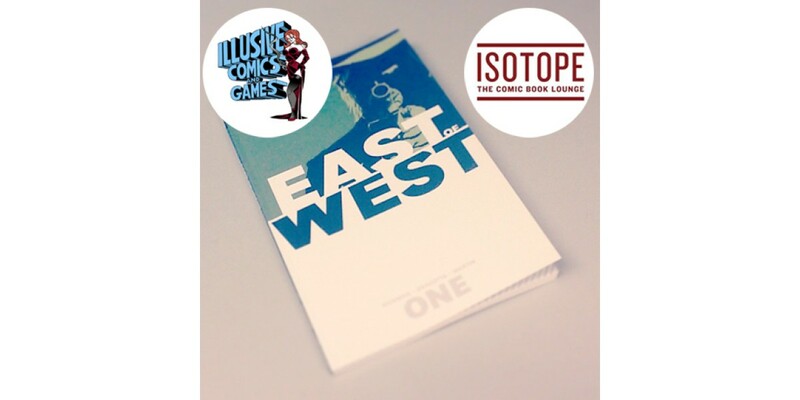 For more details please visit the Isotope website.